The aisles were packed with people looking for new ideas and innovation – and the exhibitors delivered! Couple that with over 90 educational sessions being offered and KBIS is becoming the MUST attend show of the year! In this post we discuss the finish that won’t go away, a new way for your customers to pick their decorative hardware and 360 degrees of storage. Some of you may cringe when I say this – brass is showing up even more this year. No it’s not that ugly polished brass that you immediately think of. This is a satin or brushed finish that works with wood grains and could be coupled with glossy white material to give a contemporary look. 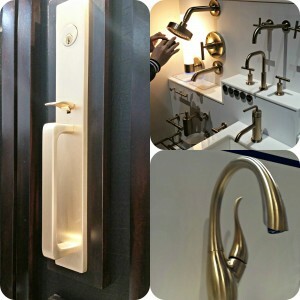 I saw entry sets, faucets, shower heads and decorative hardware in many of the booths. We all know that once consumers start using brass in their kitchens and baths it will run thru the entire home… Closets are not far behind. 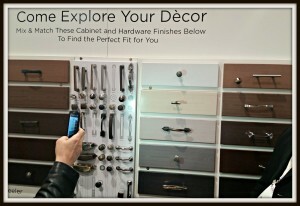 This next photo is a great way for your customers to decide on their decorative hardware. Keeler used metal drawer faces wrapped in different melamine colors so that you could easily mix and match finishes. This is an awesome idea for your showroom and something that you could easily accomplish if you use FastCaps Power Magnets and your standard drawer faces. I loved this and everyone visiting the booth was playing with the display. This is a great way to get your potential customers to visit your showroom. If you can get them in the door, it’s your job to lose and the price of the typically increases. Shoe storage is always a hot button when it comes to designing closets. Plus Closets had their Lazy Lee 360 Organizer on display. I had seen the video and was even more impressed when I saw it in person. The rotation is smooth and silent. It could be used for shoes, you could add drawers or baskets – it was a nice way to use a corner. The only downside is the size – you need to have a walk-in closet large enough to accommodate the 40” x 40” unit. 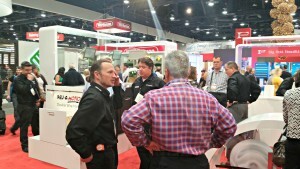 It’s your turn – What was your favorite part of KBIS or IBS? Click links below to share with your friends. Thanks for taking the time to comment Patti! !